If you're looking for your dream RV at a dream price, then come to RV World MI in beautiful, vibrant Grand Rapids, Michigan! We offer nothing but the best brands of 5th wheels, travel trailers, and more from all the top manufacturers in the world! 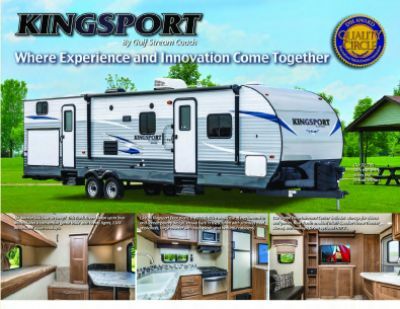 Travel the country in this 2019 Gulf Stream Kingsport 279BH Travel Trailer! Stop in and see us today at 7834 S Division Grand Rapids Michigan 49548 and let us show you how easy it is to make your RV dream come true! And with our fast, reliable, 24/7 worldwide delivery we can assist you no matter where you live! So go online and then call us today at 616-591-3632. You could have your dream RV tomorrow! Towing is easy, as this camper has a hitch weight of 710 lbs, ship weight of 5870 lbs, and GVWR of 7510 lbs. With the 7' 0" awning, you can find shade and protection from the elements wherever you go! 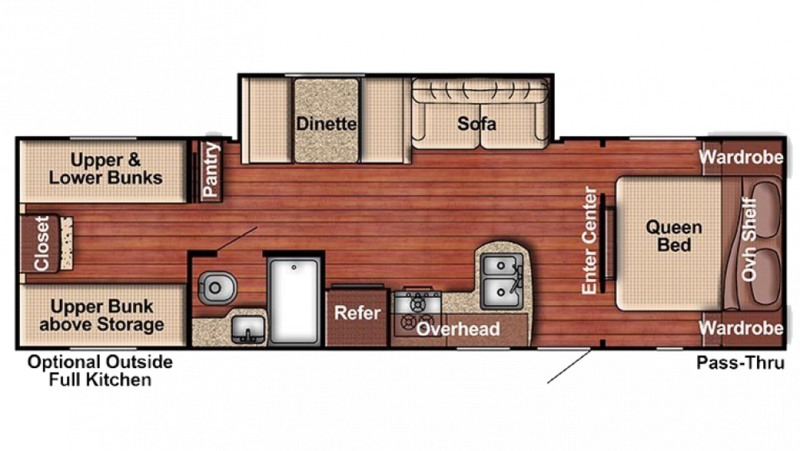 There's a lot of room for easy living in the 2019 Kingsport 279BH. It's 32' 3" long, 8' 0" wide, and has 1 slides that really maximize the living space! That's especially nice when the weather forces everyone indoors. But the climate inside will stay pitch perfect, thanks to the modern 13500 BTU a/c unit and efficient 16000 BTU furnace! Nothing beats a good night's sleep when you're camping! Thanks to the roomy Queen bed in the handsomely furnished master bedroom of this wonderful Travel Trailer, that's what you'll enjoy every night! This lovely RV can sleep up to 8 people! You'll find a full array of modern kitchen appliances in the superb kitchen area! So you won't have to rely on take-out for fast food anymore. You can stock all your favorite meats, veggies, fruits, eggs, and cold beverages in the 6.00 cu. ft. refrigerator and cook them up for breakfast, lunch, or dinner on the 3 burner range cooktop! With the 30 gallon freshwater tank, you won't have to worry about running out of clean water! No one enjoys trekking through the campground in the rain, or the cold, or the darkness just to use the damp, messy community bath facility! That's one of the big reasons you'll love the 2019 Gulf Stream Kingsport 279BH! It has a full bathroom, complete with a roomy shower, sink vanity, and a comfy Foot Flush toilet! This RV also has a 36 gallon gray water tank and a 36 gallon black water tank. There are 4 beds inside this model, with extra comfortable Bunkbeds inside the bunkhouse!